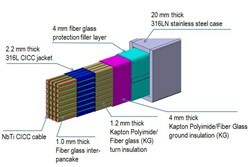 Cross section of a bottom correction coil showing the cable, jacket, insulation and 20-millimetre-thick case. Meetings last month in China have confirmed the progress being made toward qualifying the manufacturing processes for the ITER correction coils. Because the large size and unusual shape of the 18 correction coils make manufacturing a challenge; the qualification stage of coil manufacturing processes is an important step to ensure the manufacturability of these coils within specified tolerances. "The main difficulty in the manufacture of the ITER correction coils lies in the very tight tolerances that much be achieved in their final envelope dimensions, due to the narrow space reserved for them between the toroidal field and the poloidal field coils," explains Technical Responsible Officer Arnaud Foussat. "A second challenge is the unusual shape of the coils—non-planar for side coils and planar (but banana-shaped) for the top and bottom coils." The ITER correction coils: an arrangement of six 7x8 metre side coils and twelve 3x7 metre top/bottom coils (compare to the man-sized figure at bottom right). In December 2010, the Chinese Domestic Agency awarded the contract for the manufacture of ITER correction coils to ASIPP (Hefei, China), that had been closely involved in the construction of the EAST Tokamak in China and in R&D activities for ITER magnets. ASIPP is now actively preparing the installation of the manufacturing line for these coils in a dedicated building in Hefei. The selection process of all sub-suppliers should be completed by the end of this year. 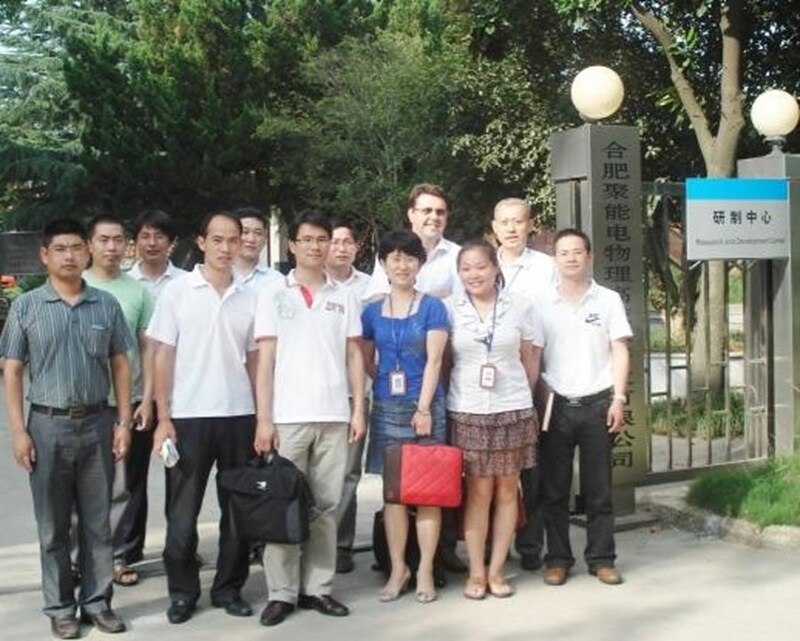 During meetings in June between the ITER Organization, the Chinese Domestic Agency, ASIPP and sub-suppliers—the first in a series to monitor the qualification milestones at sub-suppliers—some of the key manufacturing options that are under development for the 18 correction coils and coil structures were highlighted. "It is essential that our colleagues at the ASIPP and the Chinese Domestic Agency select the best manufacturing solution from the point of view of technical requirements, risk management and cost before launching the series production," says Arnaud. Meeting with the ASIPP team in China last month. An important correction coil milestone to come is the selection and pre-qualification by ASIPP of the supplier for the 316L austenitic stainless steel required for the 20 millimetre-thick correction coil case. TISCO, a worldwide leader in stainless steel production and a potential supplier, will supply 316LN hot rolled base plates and extruded profiles in order to produce a short sample case model for the definition of final fabrication processes. A welding process for correction coil case closure has also been selected; to qualify this option, a contract was placed with SIASUN (Shenyang) to supply fibre laser welding production equipment and to provide expertise to ASIPP welders. In a meeting to SIASUN premises, the proposal for an automated laser welding production line was discussed, as well the first test weld samples to be qualified at 4K cryogenic temperatures. 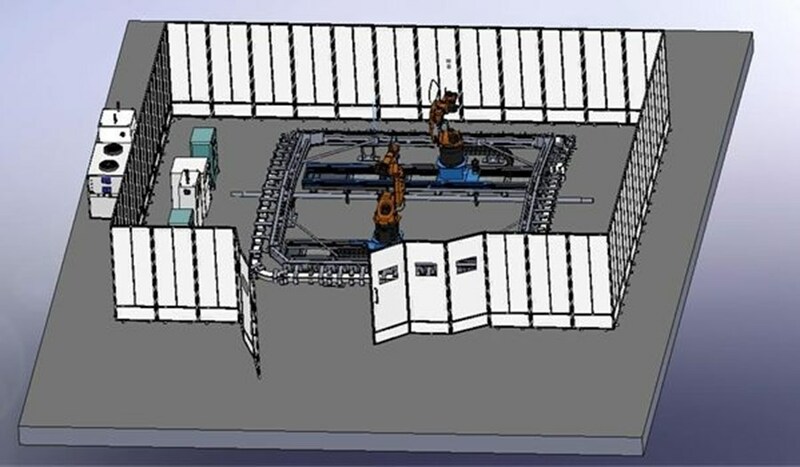 The proposed laser beam welding section for side correction coils (SIASUN). In parallel, ASIPP will collaborate with Institute of Physics and Chemistry (IPC) in Beijing to perform mechanical strength and fracture toughness at cryogenic temperature on welds and base material. "Widespread progress has been made in critical technical areas of the correction coils, I am happy to report," stated Arnaud after the visits. "The fabrication process qualification phases ahead will require tight monitoring and the close interaction of all parties in order to keep momentum and progress."